Saturn is one of the most exciting objects to observe with a telescope and astronomy binoculars. Many experienced amateur astronomers will tell you their first telescopic view of Saturn and its magnificent ring system is what got them "hooked" on the hobby of stargazing. The gas giant planet and its striking rings make an ideal target for both beginners and seasoned amateurs. 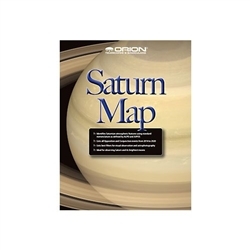 The affordable Orion Saturn Map & Observing Guide is a wonderful tool for backyard astronomers of all skill levels who want to enrich their observations and understanding of this unique gas giant planet and its spectacular ring system. We've packed the tri-fold Saturn Map & Observing Guide with beautiful images and useful tips to help you get the most out of each view of Saturn. 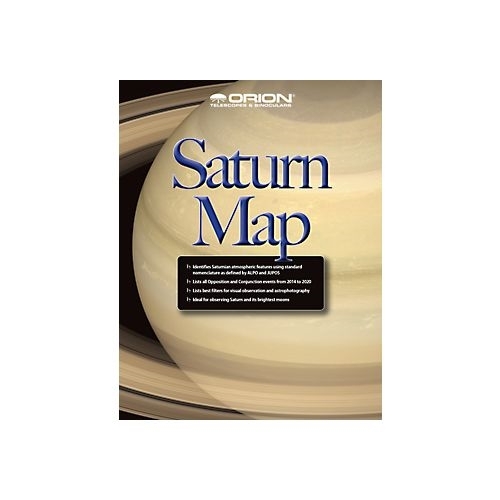 With this Map & Observing Guide at your side, you'll learn interesting information about Saturn's many moons, its extensive ring system, ring tilt cycle, and more. The Map will help you learn to identify light and dark atmospheric features of Saturn using official nomenclature. You'll appreciate the thorough list of recommended filters to help enhance visual views and astrophotos of Saturn, and the detailed list of all upcoming conjunctions and oppositions of Saturn from 2014 through 2020 will help you plan ahead to catch these interesting events.